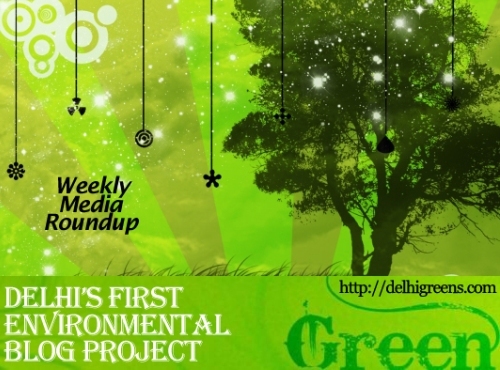 Weekly environmental news roundup from across different media networks for week 45 (starting November 5, 2012) 2012. Delhi’s forest department will constitute 10 groups, five from resident welfare associations and five from school eco-clubs, to carry out a tree census in the city. The decision was taken at a tree authority meeting on Tuesday, where it was stressed that the census should only take place with people’s participation and not be handed over to private parties. The city will soon have a special committee on biodiversity for 10,000 hectares designated for the purpose. In a meeting held recently, LG Tejendra Khanna announced the creation of the Delhi Biodiversity Foundation Society that will function as a registered body under the DDA. In a bid to curb air pollution, the Delhi government has decided to ban generator sets in marriage processions and other social functions. People holding these events will have to get temporary connections from discoms. The Centre for Science and Environment , in its latest report, has delivered a spot of bad news: The smog is here to stay. It has also warned that Delhi is in the grip of a multi-pollutant crisis. “Particulate matter is not the only thing choking us. Burning of paddy straw and stubble could soon become a punishable offence in the National Capital Territory Region as smoke from such fires has been identified as one of the contributing factors to rising air pollution in the city. The Ministry of Environment and Forests was today asked by Delhi High Court to respond to a plea that it has delegated illegally the powers to “non statutory” panel NABET to regulate accreditation of environmental consultants who help in “appraising” projects. Worried over the critical state of environmental conditions in Ghaziabad, the National Green Tribunal has directed Uttar Pradesh authorities not to allow setting up of any new industry there without its approval. UNESCO today lauded India’s efforts towards environmental sustainability and said a multi- dimensional approach in this regard is the need of the hour globally.